In mid-September, I escaped for a couple of days into the mountains. I included a fine off-trail ramble with a friend into an area of mixed conifer and aspen in the wilderness; an area we knew holds plenty of elk. Although a nearby Forest Service road takes plenty of summer visitor traffic, few venture out of their vehicles. And between Labor Day and the beginning of the elk hunting season, few other folks bother to be out at all, let alone off the road. There is no trail, so it pays to be comfortable with navigation skills. We left the road, climbed halfway up a ridge line and paralleled a little creek for a mile or so. Stands of aspen alternated with spruce and Douglas Fir. We passed through a couple of small meadows ringed with aspens, many of which were marked with elk teeth. Passing through another stand, I spotted a large elk antler amid the leaves, shed last year. There were a few nibble marks where some small critter had chewed a tine against the ground but the rest was well preserved and heavy with bone. The 6-tined beauty now graces our getaway fishing cabin. 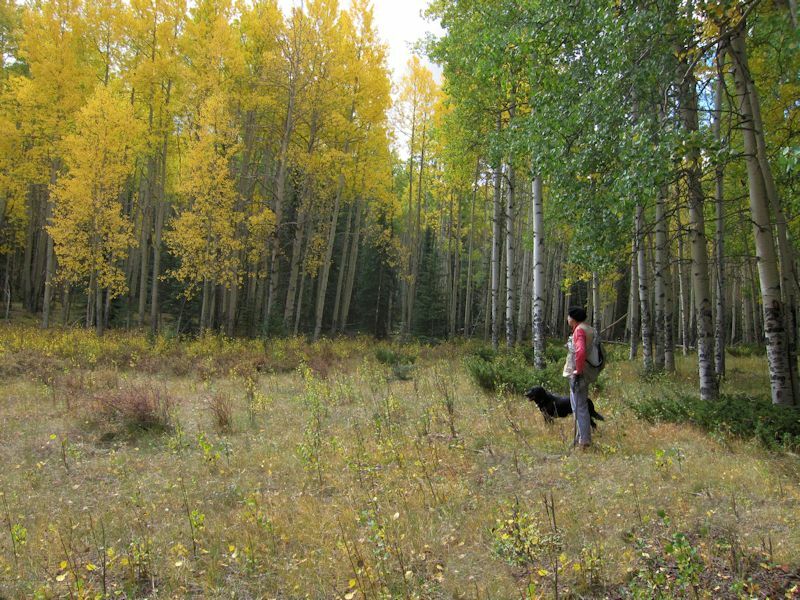 In another mile, we came into a thinner patch of aspen stand and caught of whiff of barnyard smell. On a hillside otherwise fairly dry, here was a moister patch of churned-up mud between 2-3 yards across. 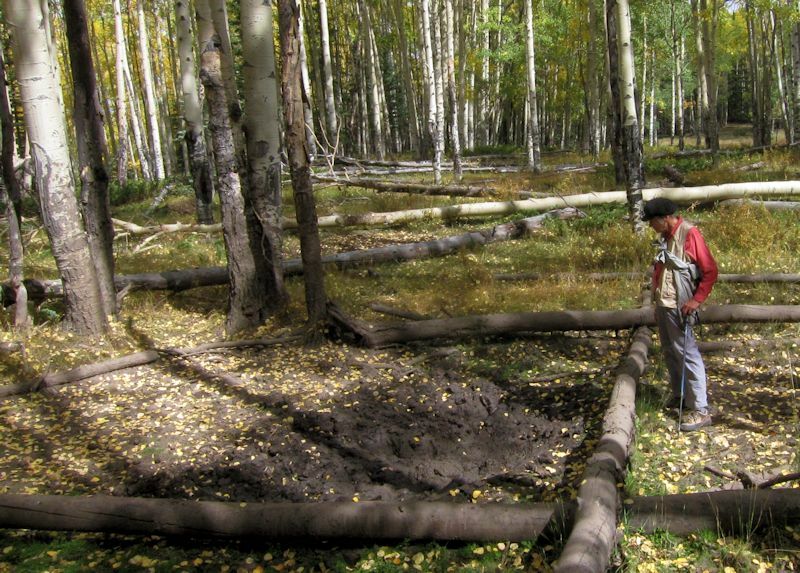 In early Fall, bull elk wallow in places like this. At the beginning of the mating season–called the “rut”–when the weather is still warm, bulls seek out a spot like this where they urinate and roll covering themselves in their own scent. The muddier and stinkier the better it seems. I’ve heard elk hunters compare wallowing to high school football locker room rituals. 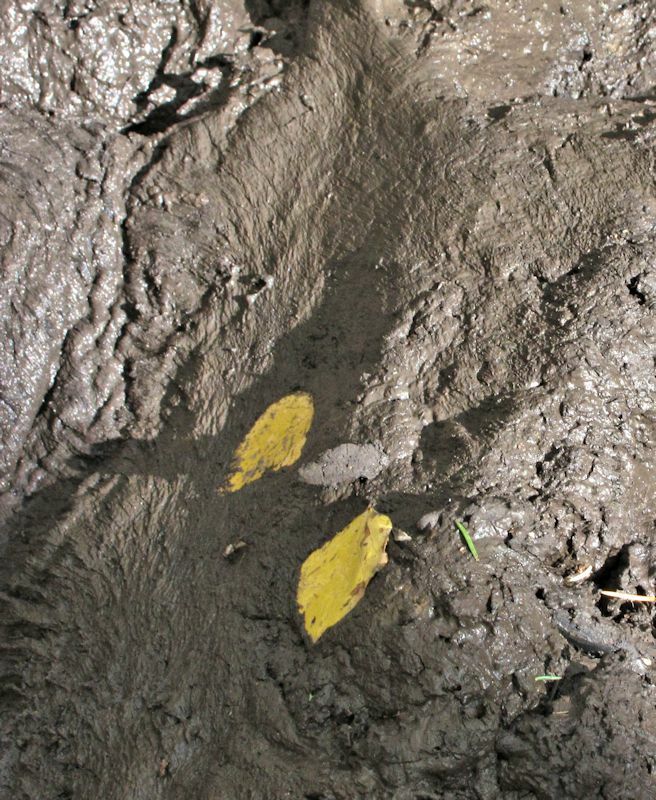 This wallow appeared to have been used over a lengthy period, probably years, as for some distance surrounding logs were painted with fine layers of old mud as animals came and went from the wallow. It had more recent use too as the place was a maze of tracks, many very deep from the weight of at least one bull. He had visited fairly recently as we could see the imprint of his hair in the softer spots. It looked like the style of wall plastering where the trowel is pulled away from the wet plaster to leave a texture. Sometimes you’ll see the imprint of an antler, too, although we were not so lucky this day. Since my time was at an end, we turned around without seeing or hearing any elk that day. But we sure knew they were around from all the signs they’d left us. This entry was posted in Critters, Flowers&Fauna and tagged elk, Forest, mountains, nature, New Mexico, wallow, wildlife. Bookmark the permalink. Very nice post. I appreciate it a lot.